Here’s the rule to remember how this tool works. Whatever is completely within the crossing window gets moved. And whatever the crossing window is crossing gets stretched. If you keep ortho on or are able to snap to something in the desired direction, you will find this tool to be very helpful. Select objects using and crossing window (default) or CP <enter> for crossing polygon. 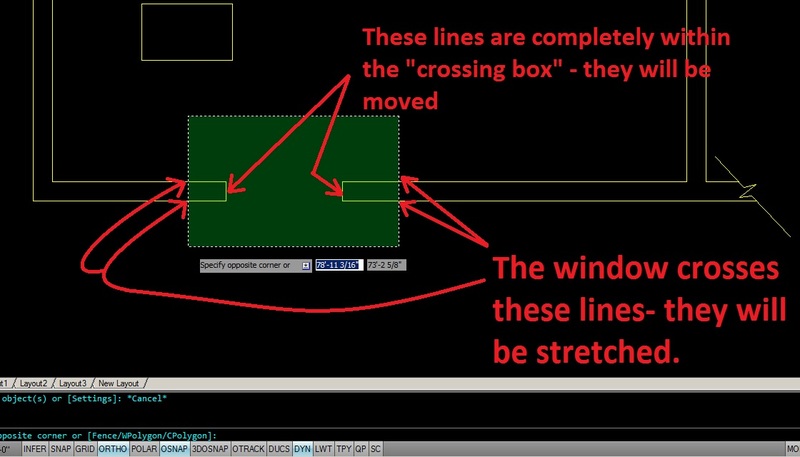 You can also use C <enter> to make a crossing window in any direction as explained HERE. Specify a base point anywhere along the direction in which you you plan on stretching. move your cursor in the direction and either click to end or type in a distance. The following animation shows how you can use any number of selection methods when selecting objects as I have mentioned before HERE. Notice that When prompted to “select objects” I enter C <enter> and then now matter which direction the window I make, it is always a “crossing window” (green window). Just what I was looking for. Thank you so much. 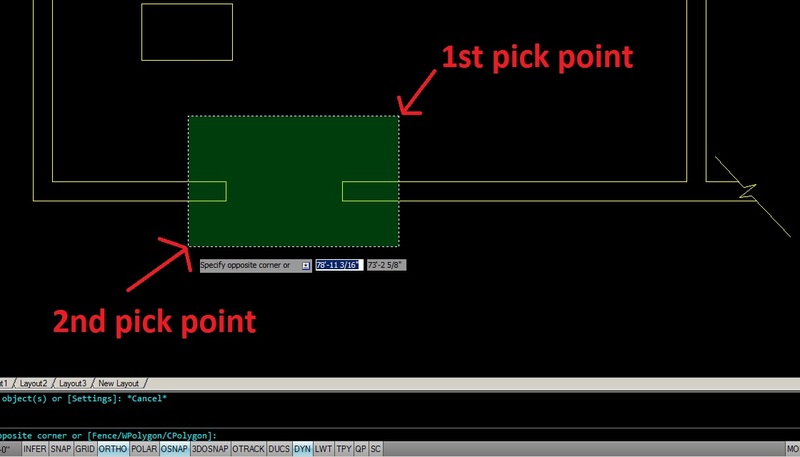 Do you have tutorial videos or sites for autocad? I don’t have a video series or anything like that. I try to keep the tips posted on this blog fairly short. I did create one video though found [here] that shows how to quickly copy lisp code from this blog and test it. Being used with 3D parametric modeling software I always stumble upon this when using AutoCAD. So amazed that AutoCAD is still mainly non parametric. I’m glad that you found the tip. One thing I would like to follow up on – when you are prompted to make a crossing window, it doesn’t have to be from left to right. It just has to be the green type of “crossing window”. This can be achieved in any direction by typing in WC in the command line when asked to make the selection. Really useful tip about a command which is so useful but not easy to grasp at first. Thanks for the tip on using stretch. I am study up for the AutoCAD exam and the course book does a poor job of explaining how to use stretch. This was much more useful. hi … its too cool…can you please explain me ..for the above example in between two line itfhere is a hatch how can we streatch hatch tooo..
As long as the hatch(es) are “Associative” which means that they will adjust to a boundary if the boundary is moved, the hatch should follow accordingly. It is difficult to re-associate hatches in some instances so it might be easier to erase the hatch and place a new instance of the hatch and make sure that “Associative” is turned on. how do I expand a full drawing? I have gone through your article and it’s just an amazing article . Thanks for posting such a wonderful article.Keep posting. Many thanks for the tips. I was having a lot of trouble with stretch to include the hatch. Associative has fixed it.